I have no problem admitting that it is too easy for the wrong people to get possessions of firearms. I also have no problem in admitting that it is a dangerous thing for the populace in general to be forbidden to access firearms. As I see it there is a worsening gap between these two statements. I do not see a solution. There is a strong presence of politicians and voters who would like to ban all firearms, from so-called assault rifles and handguns to shotguns that are primarily used for hunting. These people strategically do not usually speak this way, but rather argue for incremental removal of dangerous weapons. By banning some weapons, criminals will choose those easier to obtain. Then those easier to obtain must be removed from circulation. Eventually, all firearms would be banned, then sharp objects. They seek to disarm all a nation’s population, leaving firearm possession to police, military, and some private security (especially for the elite members of society). The (usually) unstated assumption of this group is that a strong central governing authority must have the security to operate in the best interest of all its citizens, and that such a government, free from the threat of violence from the populace, will always be benevolent and do good to those citizens. This mindset does not believe that mere humans can be trusted with firearms, but believe that rulers of people can be. Human depravity is only a problem of the individual, never the state. There is also a very strong presence of people who do not trust those who would remove their right (or privilege in Canada) to own firearms. They observe governing powers and see an ever-increasing lust for control over the individual. They see an increase of abuse against citizens by law enforcement (say, no-knock warrants and civil forfeiture). They know that their everyday existence is regulated, taxed, monitored, and controlled. What is not yet under a regulation or tax soon will be. There are laws that dictate proper behaviour, what must not be done and what must be done. Attempts are made openly to dictate speech, religion, thought and conscience. Those who resist such control are worried that so many of their neighbours vote such governments into office and are so willing to surrender their rights to those in power. Like taxes that are never rescinded, regulations are never reduced, only multiplied. The time seems near that an average individual, simply living daily life, will be in violation of a code, bylaw, or statute. This group believes that a state can be depraved, as well as some individuals. Firearms to are protect individuals from both an evil state and an evil intruder. It should come as no surprise, then, that firearm owners are not eager to give up that one thing that a government fears most: a way to say “no” to tyranny. Rulers have some fear of the populace during elections, but electoral wins can be had by fraud. There is, though, a real fear among leaders; fear of population that will oppose them with armed violence. But are the benign governments of the West truly tyrannical, do they truly seek to exert undo control and curtail freedoms and human rights? Is this fear of government power unfounded? What assurance is there that a cadre of leaders, having disarmed its citizens, will not then enslave them? What assurance is there that there is a more noble goal, when government only seeks more control over its people? Are modern governments seeking to increase, or decrease control over their citizens? At what point of control does a government become a dictatorship? How does tyranny occur–is it sudden, or is it incremental, in small steps? Is it not clear that when a government official fines a child’s lemonade stand (for no licence) that there is culture of control? Again, think of how many laws and regulations have been rescinded and how many new ones must be learned and obeyed. When modern governments seek to increase influence over the most minute details of daily life, shouldn’t someone be a little suspicious when that same authoritarian mentality makes total disarmament its aim? The suspicious ones worry modern governments. And that’s a good thing. Between these two mindsets I do see a solution, one guaranteed to upset: the occasional mass shooting by deranged individuals is to be preferred to the daily mass shootings by deranged nations. Our First 500 Years, Our Next 500 years. Five years ago, my wife’s great-aunt wrote her autobiography, My First Hundred Years (Helen Portenier). As of last month, she is five years into her second hundred. Yesterday was the Five Hundredth Anniversary of the nailing of the Ninety-Five Theses to the church door at Wittenberg by Martin Luther. Many wrote excellent comments, shared resources, and there are even some new Luther Documentaries available online. I intend to join in the sharing in the days, weeks, months, and years to come. 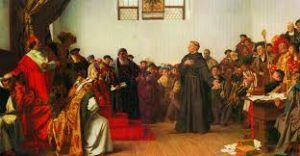 There were many who sought to reform the church before Luther, but his stand against the Roman church of his day is something of a watershed moment, a time in history that changes things in a way that things will never be the same. We should teach the past and rejoice in God’s faithfulness. Shari has done extensive research into our family trees. We both descended from Huguenots, and we are also descended from Puritans: her eighth great-grandmother (Martha Carrier) was falsely accused of being a witch in Salem and was hung there on the nineteenth of August, 1692. Some of my family (Philip and Martha Cody) arrived in nearby Beverly in 1698. I have other ancestors (Edward Fuller) who arrived on the Mayflower in 1620. It is exciting to learn that we have roots in Puritanism and in the Huguenots. With so much I could have written about the Reformation, I chose only this: “Soli Deo Gloria,” to God alone be Glory. I let others, better qualified than I am, to write articles and commemorations. I did this intentionally. I wish to use this space to look to the future and to understand that future as ascribing all glory to God. Thinking back to aunt Helen, I don’t believe that she will someday write, My Second Hundred Years, as wonderful as that might be. But as this year marked the end of the first 500 years of Reformation, it is implied that there is a next 500 years. Five hundred years from now there will be Christians commemorating the millennial celebration of the Reformation. Our writings today may seem to our descendants as archaic as the Geneva Bible (the Bible of the Mayflower Pilgrims) sounds to our ears. But the content of the Reformation will remain. Will there be another Reformation? “Semper Reformanda” (the church must always be reformed) is essential to the continued health of the church, as Luther wrote in his first of the ninety-five theses, “Our Lord and Master Jesus Christ, when He said Poenitentiam agite (repent), willed that the whole life of believers should be repentance.” [Martin Luther, Disputation of Doctor Martin Luther on the Power and Efficacy of Indulgences: October 31, 1517, electronic ed. (Bellingham, WA: Logos Bible Software, 1996).] Reformation and repentance will always be sought after by a faithful church. The Five Solas and the TULIP acronym are not Scripture but are Scriptural. I am not taking time here to defend or explain these. The purpose of this post is merely to show what needs to be carried into our Next 5000 Years.